Before P was born every craft I did had a girly ting to it. Tutus and bowholders and sparkly stuff. And while P has no problem dumping glitter all over the house, from time to time I like to make something that is a little more him. 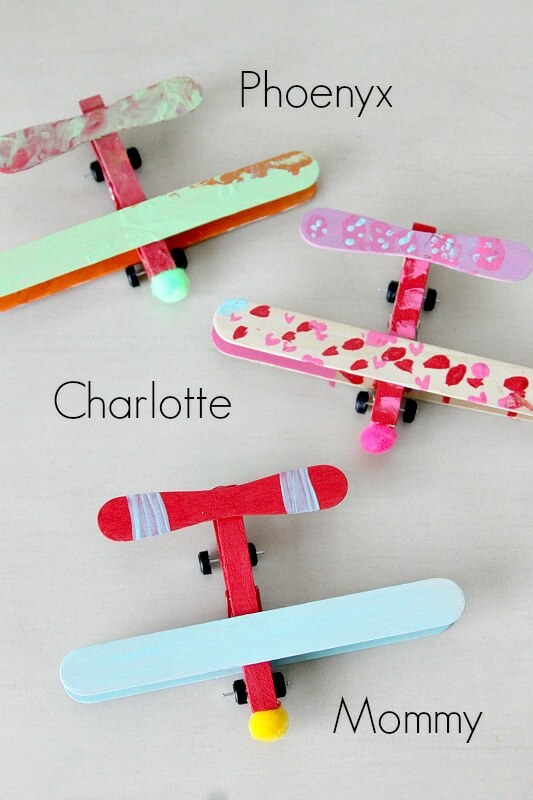 And since he loves loves loves his Matchbox cars and inevitably breaks a few, I decided that we should repurpose them into Airplanes. The whole process is easy, fun, and great for any age as long as you have someone old enough to do the final (hot) gluing stage. First do the fun stuff…paint! I let the kids have at it and paint the wings and the clothespins. It got a bit messy. Once the kids painted the clothes pins and sticks, I just laid them on a plate to dry. Now lets move on to assembly. I am going to use my plane as the example. 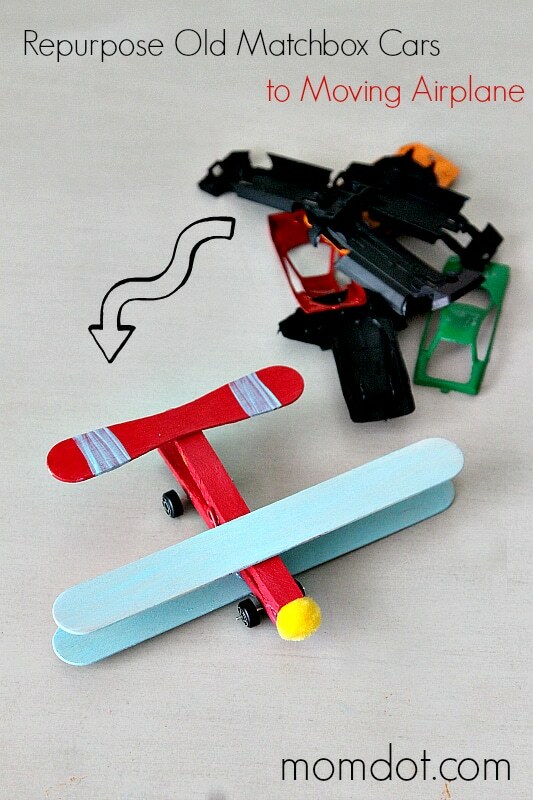 All you need to do is take your clothes pin and two large popsicle sticks for your bi plane wings. Center one over the clothespin and glue on the top and then, making it even, glue one on the bottom. Those are your wings. Next take your smaller stick and glue on the backside of your clothes pin. This is your planes tail. Now dissemble your old matchbox cars and pull off the wheels. It was pretty easy to pop the top off the car and then remove the wheels. Hot glue one set on the back and one on the front. You will need two sets to make sure your plane balances. That’s it! Now you can play with them! Fun, right? I love that we could do this with all ages in my house. P is 2, Charlotte is 9 and Mommy is 29…right…. And a great way to not let those broken toys go to waste! Win a Stay in Destin (Contest!)! 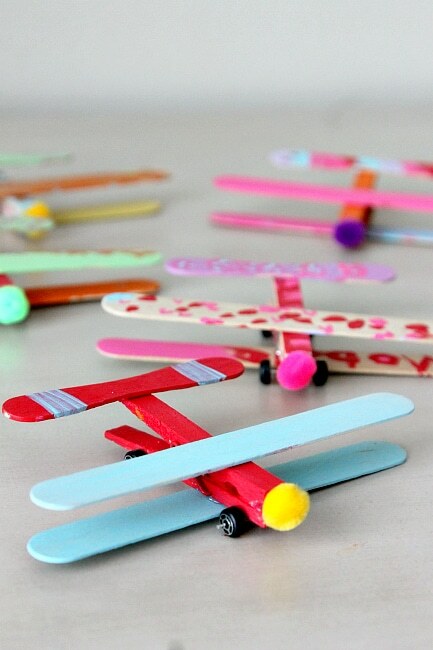 Cloth clips, Popsicle sticks, match box car wheels…..I have plenty of them in LO’s toy box…..my munchkin will love this DIY. This is a great idea! My son has so many cars laying around in his room. We might just have to get crafty! This looks like a lot of fun Trisha. I bet my kids would enjoy this. Thanks for sharing! That is very cool! How fun that you could all do it together! How fun!!! 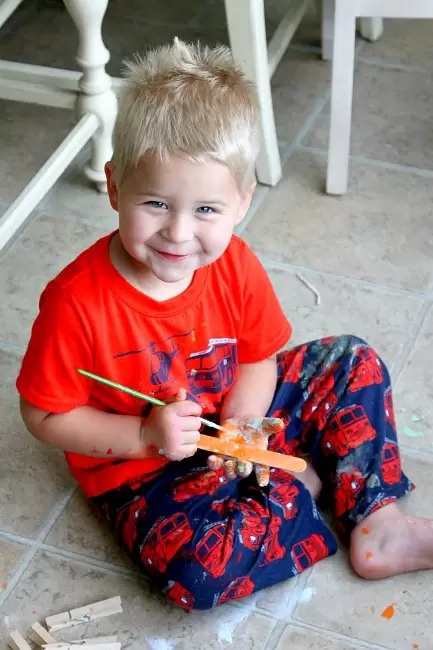 I love the look on P’s face as he’s painting…it’s all over him, but you can just tell he is having a blast!